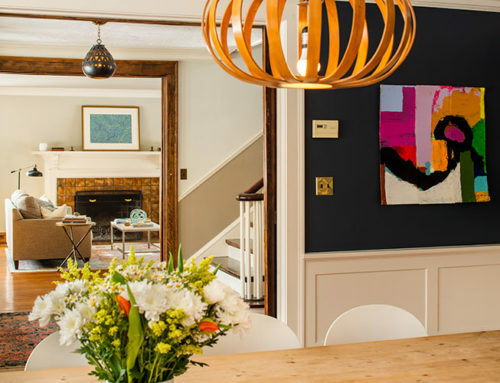 Mark and Sonya Vogel’s Shaker Boulevard home captivates with both formal and whimsical decor. Wallpaper designed by the centuries-old French manufacturer Zuber. 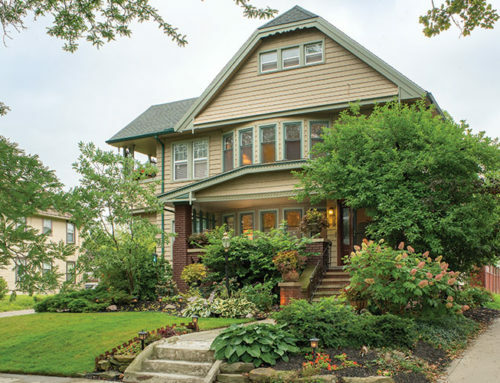 Buy a home in Shaker from a seller who’s owned the house for decades and odds are it’s due for some updating. Perhaps the 1980s kitchen could use a facelift. Or maybe the living room needs a fresh coat of paint and some updated lighting. As for all that wallpaper? Start scraping. 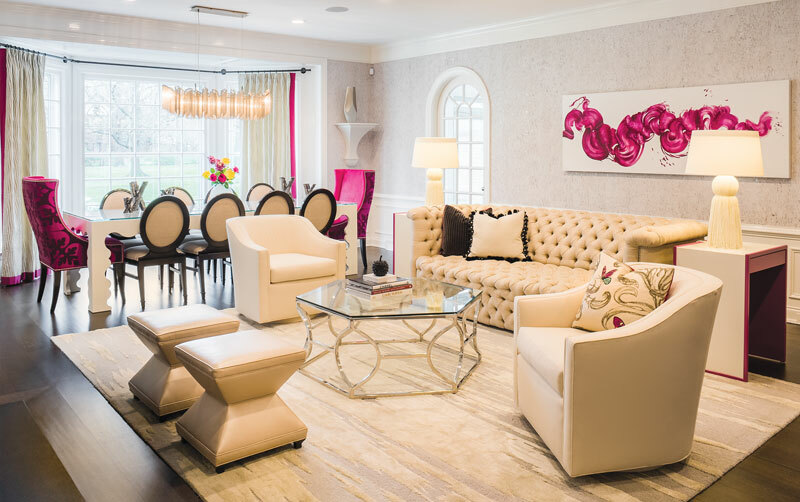 When Mark and Sonya Vogel purchased their home on Shaker Boulevard in 2011 from Cleveland philanthropists Milton and Tamar Maltz, the home had been meticulously well-maintained, but the Vogels wanted to make it their own with a more modern aesthetic. They had long-term plans to gut the kitchen and breakfast nook and expand its footprint. They wanted to open up the living room and give it a brighter décor. And as for the mural wallpaper with horseracing scenes that hung throughout the foyer and second story hall…. “When we first walked in, we thought it was really cool and special,” explains Mark Vogel. The wallpaper is special, so special that David Maltz, the sellers’ son, asked the Vogels during the sale negotiations if they would be so kind as to keep it. Showing them papers from Christie’s, Maltz explained the paper was made by Zuber, a prestigious French wallpaper manufacturer. The company prints mural and patterned wallpaper today the same way it did two centuries ago: by hand, using antique and traditional woodblocks. Since Zuber’s 1797 founding, its wallpaper has been installed in some of the world’s most famous residences (a certain Pennsylvania Avenue presidential mansion being among them) and in the more modest homes of arts enthusiasts, like the Maltzes. The Vogels never had any intention of removing the wallpaper, so honoring the request was easy. 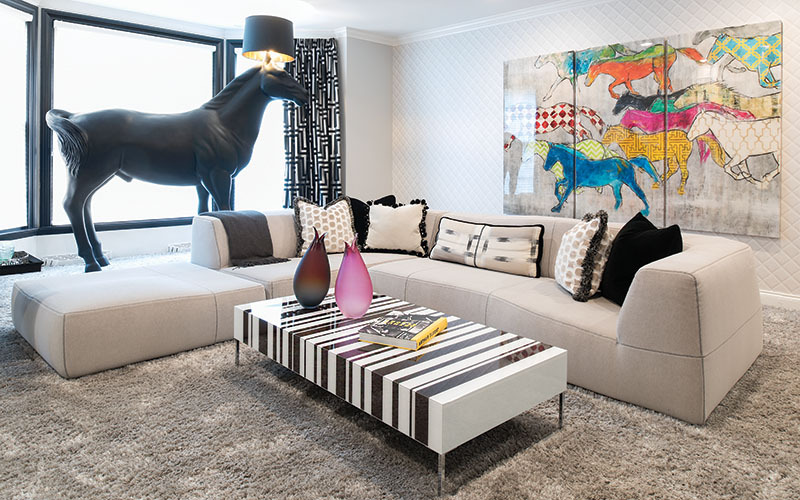 But they also never anticipated just how much the equine theme would become a part of their decorative and artistic choices. For the first few years, the Vogels made earnest efforts to redecorate the house on their own. They pored over magazines and catalogs and took design cues from the rooms at the Mondrian South Beach, a Miami Beach hotel known for its modern decor and combinations of patterns and colors against a largely white backdrop. 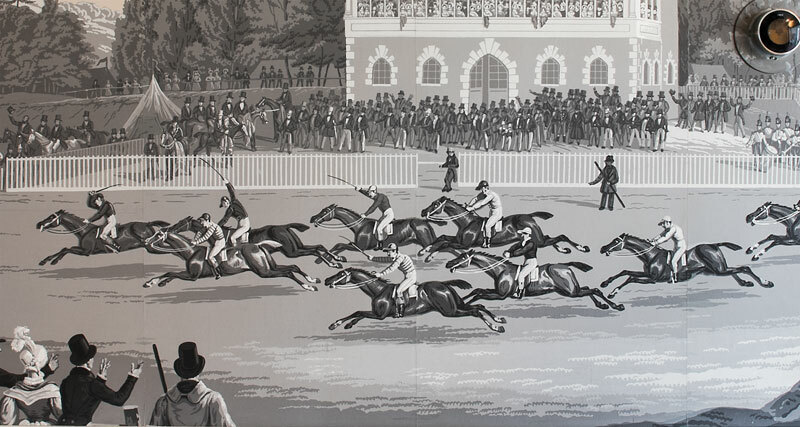 The wallpaper’s equine theme came to play an important role in the Vogel’s interior design. They knew the look and the feeling they wanted and, after careful selection, they purchased some new furniture. But when the new furniture was delivered, it was damaged. 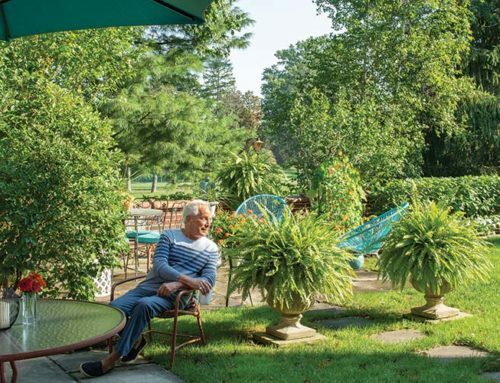 Discouraged, the couple interviewed interior designers and discovered Libby Palmieri, founder of Solon-based House of L.
Mark agrees, even though he admits that his first reaction to the lamp was shock. “We chose it a little tongue-in-cheek,” he explains. “You walk in the house and it’s serious, then you see this. I like that it’s binary. You’re either going to love it or you’re going to hate it.” When guests visit, Mark says the reactions range from the enthusiastic – “Can I ride it?” – to the reserved – “Hmmm…that’s nice.” While the room is done largely in white, there are bursts of fuchsia, yellow, and cobalt in the room’s center and in the wall art that invite a look beyond the lamp, much like the effect of a well-composed painting. A custom-designed lacquered dining room table. Step back into the foyer and through the sunken great room and it’s clear that careful thought was given to every design and decorative element in the room. Look closely and there are subtle reminders of the theme. 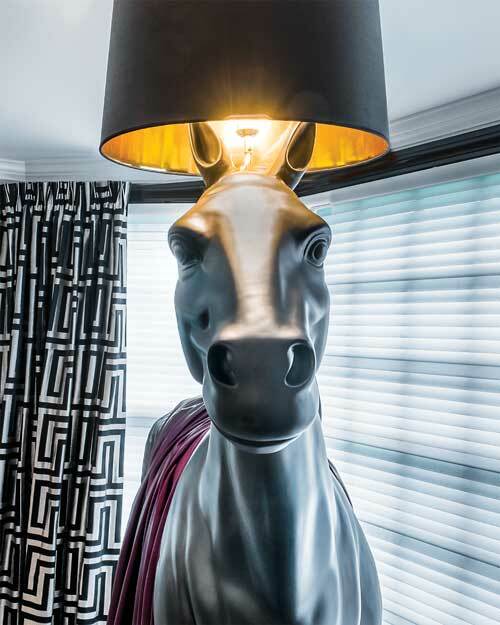 A gentle fringe on the lamps is reminiscent of a smoothly brushed mane. The base of the glass coffee table resembles a horse bit. Swirls of magenta on a white canvas evoke a sense of fluidity. A pair of angular vases calls to mind a horse’s head. “I always try to incorporate some sense of whimsy in my designs because I feel it lends an air of fantasy that is so void in most people’s lives,” Palmieri says. The room’s opposite end includes a custom-made lacquered dining table with seating for ten. Above it, a sculpted fringe chandelier mimics the movement in the great room’s painting. Magenta accents on the dining table’s end chairs, end tables, and window treatments complement the painting. It’s hard to be in the room and not want to feel the fabrics and inspect everything more closely. But daily life in the home is hardly like being in a museum. That’s not the feeling the Vogels wanted to project. For sure, they’ve invested a lot of time and money into their renovations, but that’s also because they truly enjoy and appreciate the process of design – the planning, the construction, the detailed work. Sonya says the net result is a home that’s very livable. “I practically live in the kitchen,” she says. Enter the kitchen and it’s easy to see why Sonya spends so much time there. It’s not just that her workstation is in the kitchen or that there’s a plumbed-in coffee machine. 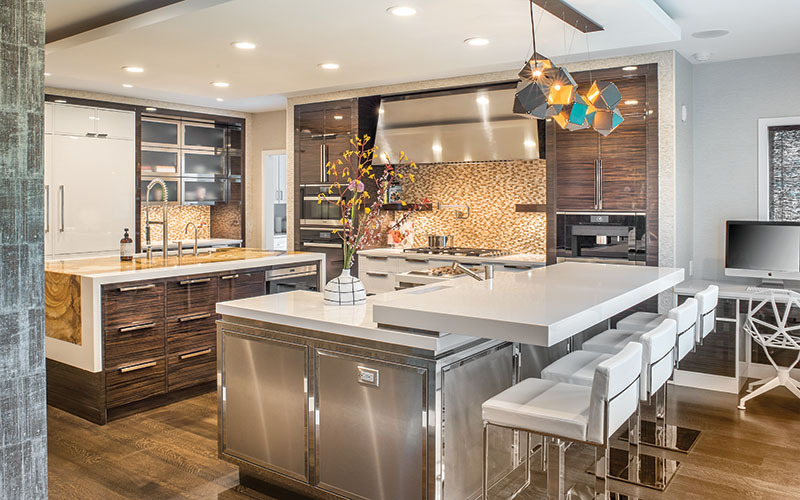 The reality is that everything in the room – the marbled gold quartz inlay on the island, the nubby textured tile that frames the cupboards and appliances, the highly glossed ivory refrigerator doors, the sublimely geometric light fixture – compels you to stay. The couple’s daughters also benefitted from Palmieri’s imaginative eye. She selected the vibrant pinks and oranges in the girls’ rooms and envisioned the built-in desks and the headboards that seem to embrace the beds. “I love reading with them at night in here. It’s like being in a little cove,” Mark says. Now that they’ve had a successful renovation and redecoration, they admit that they look at homes differently. “When I go into someone’s home now, I’m just more aware of how things are done. Not in a critical way. I just love being in and looking at homes. It’s our hobby,” Sonya says. Next up, the Vogels plan to renovate the back patio with a fire pit and outdoor living space. They’ll leave any plans for a stable on the cutting room floor, but rest assured, the space will be wholly theirs and undeniably inspired.